It’s time for the latest installment of my Decades series, wherein I highlight the albums of a specific year in the 70s, 80s, 90s and 00s. I last wrapped up the ‘zeroes’ by hitting 1970, 1980, 1990 and (earlier this year) 2000. Before that I did the ‘twos,’ starting with my birth year — 1972 — and jumping ahead from there. Now I turn to the ‘ones’ and kick things off with 1971. As usual, I will count down my own favorite albums from that year before spending a week on widely acclaimed albums of the year with which I am unfamiliar. Today’s random track appears on Joni Mitchell’s 1971 album Blue, her fourth, widely considered one of the greatest singer-songwriter records ever made. I don’t know Blue well enough to offer my own opinion. I have long had a problem with Joni Mitchell as a vocalist that has kept me at a distance from her work. My loss, I know, because this is clearly next-level songwriting. It’s funny that, for a guy who isn’t a fan of Joni Mitchell, I own four of her albums. 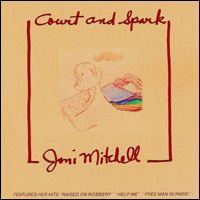 I bought Court and Spark and Blue somewhere along the way in my quest to own all of the albums a person should own. I never listen to them, but I gave them a shot. I also own Hits (courtesy of my sister, a Mitchell fan) and Both Sides Now, a 2000 covers album which might have spontaneously generated on my CD shelf, because I have no recollection of how it got there. I have to admit, I feel a little bit guilty about this one. Joni Mitchell is a legend by any definition who has inspired countless artists over the years, including many I hold near and dear. She is a gifted poet and a peerless songwriter, nothing less than an American treasure. But I just can’t stand listening to her. Both her voice and her manner of singing are off-putting to the point of annoyance. I want to get past that, because lord knows I’ve scoffed at that argument for disliking Bob Dylan over the years. It seems like such a silly reason to avoid such a talent. But we’re talking about music here… you have to listen to it. And if the actual listening isn’t any fun, it kind of defeats the purpose.